Tag line: "Fear. Sacrifice. Contact"
2013’s Europa Report is a low-budget found footage-style sci-fi / adventure that packs quite a wallop. Sent on a privately-funded 18-month mission to investigate the possibility of life on Europa (the largest of Jupiter’s moons), the spaceship Europa One and it’s international crew, including ship’s captain William Xu (Daniel Wu), pilot Rosa Dasque (Anamaria Marinca), chief engineer Andrei Blok (Michael Nykvist), marine biologist Dr. Katya Petrovna (Karolina Wydra), assistant engineer James Corrigan (Sharlto Copley) and science office Daniel Luxembourg (Christian Camargo) encounter a number of problems during their journey, and at one point even lose contact with Mission Control. Yet what happens to them on the way is nothing compared to the terror they experience once they reach their destination. 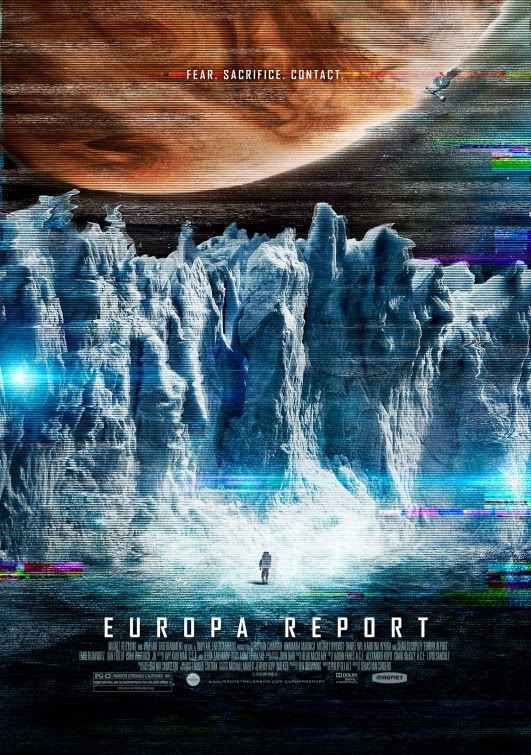 In order for found footage to work, you have to believe what you’re watching is, at the very least, something that could have happened, and thanks to the excellent performances of its entire cast, Europa Report manages to pull this off. From the early scenes, where the crew is getting to know one another (playfully mugging for the cameras that have been placed throughout the ship), to the first sign of trouble (a solar storm knocks out communications), I believed I was watching real people dealing with real situations. Their conversations, while somewhat tech-heavy, felt genuine, as did the manner in which they reacted to each new wrinkle, gathering together to discuss and debate the best course of action. And while this did make Europa Report dialogue-heavy at times, the movie certainly has its share of excitement as well (shortly after the ship loses contact with earth, Corrigan and Blok venture outside to try and repair the damage, leading to what I believe is the film’s most dramatic sequence). The film does begin to fall apart by the time the final act rolls around, at which point Europa Report transforms itself into a sci-fi / horror hybrid, yet even these later scenes have their moments (an attempt to quickly take off from the moon’s surface doesn’t go according to plan). Produced for less than 10 million dollars, Europa Report is proof positive that, to make a smart, edgy sci fi film, you don't always need a big budget. Sometimes, all it takes is a good idea, and the right cast to bring it to life.